Apple trees, depending on the variety, bloom in either spring or fall with bright white blooms that appear after foliage buds have broken. Apple trees produce dense, deep green foliage, creating a wonderful frame for their colorful fruits. Apple trees should be planted in a full sun location for best performance, and do best in in well-draining, neutral soil. Heavy clay or alkaline soils can be challenging for apples. Most apple trees require another variety of apple nearby with which to cross-pollinate in order to set fruit. ‘Red Delicious’ and ‘Golden Delicious’ are good cross-pollinators to plant for most other apple varieties, as long as they bloom at the same time so bees can make the most of their pollination process. Apples also have chilling requirements, meaning the number of hours they are exposed to temperatures between 32-50F during winter months. ‘Anna’ apple trees produce heavy harvests and require only 200 chilling hours -making them more suitable for warming climates. ‘Fuji’, an grocer’s favorite, grows to 15-feet tall and also has low chilling requirements. ‘Granny Smith’, with bright green skin and a crisp flavor, grows to 15-feet tall. ‘Arkansas Black’ has unusual, dark plum skin and that is best eaten after a month of cold storage; it is also a popular variety for cider-making. 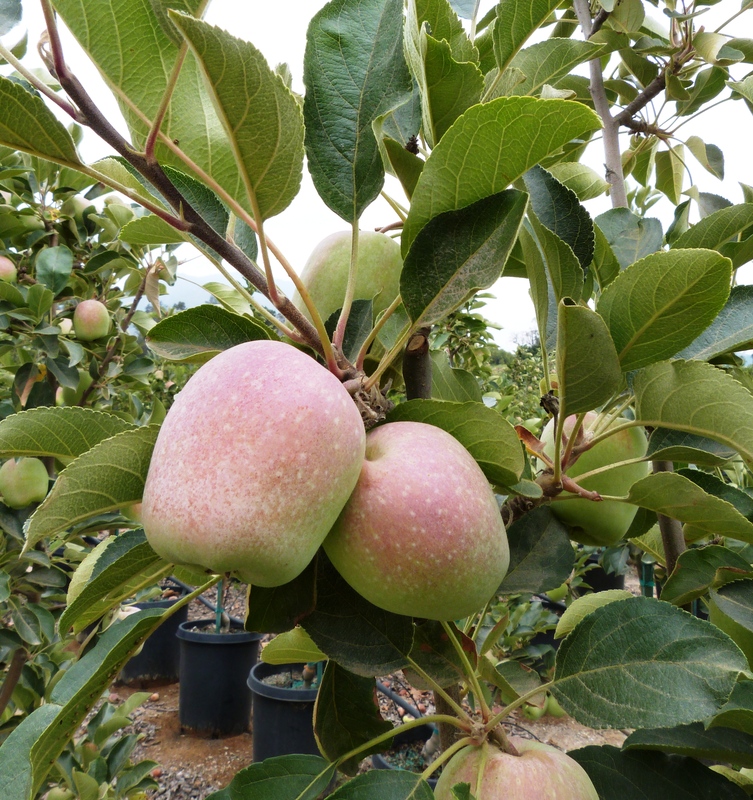 ‘Eishemheimer’ and ‘Golden Delicious’ are similar in flavor, with a crisp, tart flavor perfect for baking. ‘Gravenstein’ has yellow skin flushed with red and is an early season variety good for both eating fresh and cooking. One of the first of the season to ripen, ‘Gala’ apples are a staple among apple enthusiasts. This apple tree variety bears small, bright red fruit with a crisp, sweet flavor. Many of our apple tree varieties also come in semi-dwarf sizes for smaller landscapes or large containers.